^ a b c Clements, J. F., T. S. Schulenberg, M. J. Iliff, D. Roberson, T. A. Fredericks, B. L. Sullivan, and C. L. Wood. 2017. The eBird/Clements checklist of birds of the world: v2017. Downloaded from http://www.birds.cornell.edu/clementschecklist/download/. (Retrieved 11 July 2018). ^ a b BirdLife International. 2017. Apteryx mantelli. The IUCN Red List of Threatened Species 2017: e.T45353580A119177586. doi:10.2305/IUCN.UK.2017-3.RLTS.T45353580A119177586.en. Downloaded on 14 July 2018. 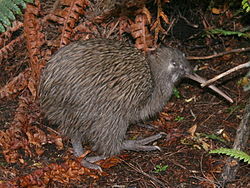 ^ Alan J. D. Tennyson, Ricardo L. Palma, Hugh A. Robertson, Trevor H. Worthy and B. J. Gill, "A new species of kiwi (Aves, Apterygiformes) from Okarito, New Zealand," Records of the Auckland Museum Volume 40, 2003, Pages 55-64.